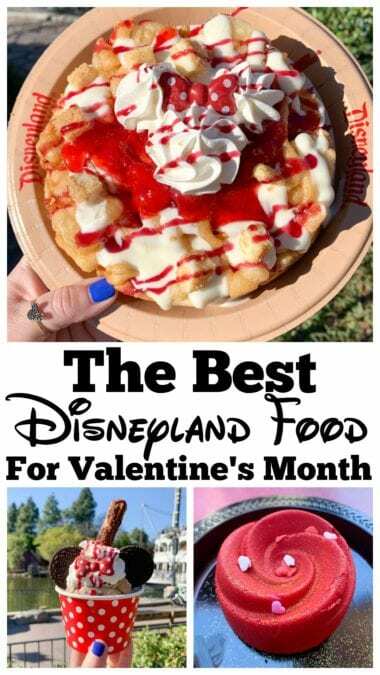 Sharing my reviews on the Best Disneyland Food for Valentine’s Month 2019! 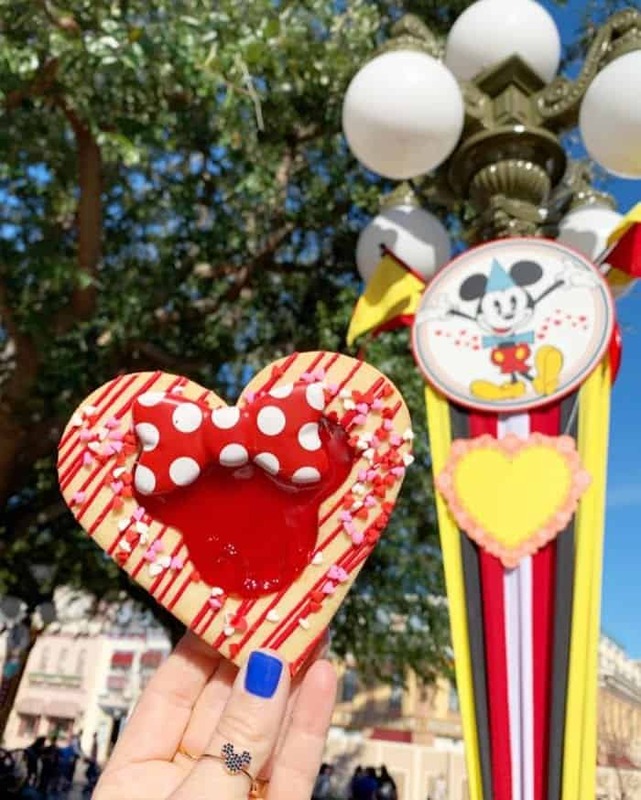 The most adorable sweets and eats at the Parks to enjoy! 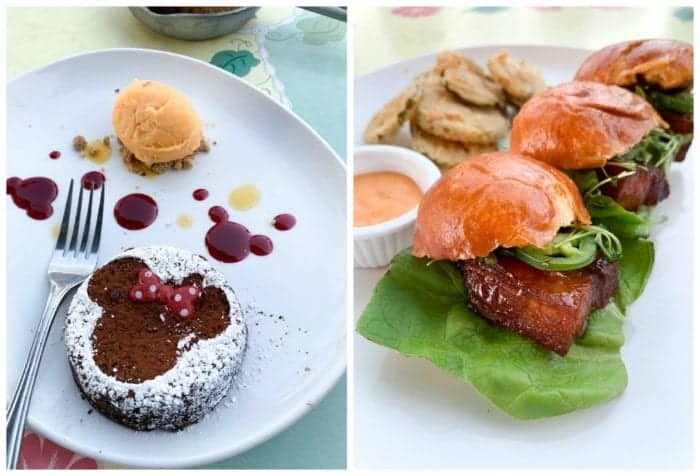 Enjoy Valentine’s Day Food and Festivities until February 18th! Gibson Girl Ice Cream Parlor, Main Street, U.S.A.
Gibson Girl Ice Cream Parlor on Main Street. 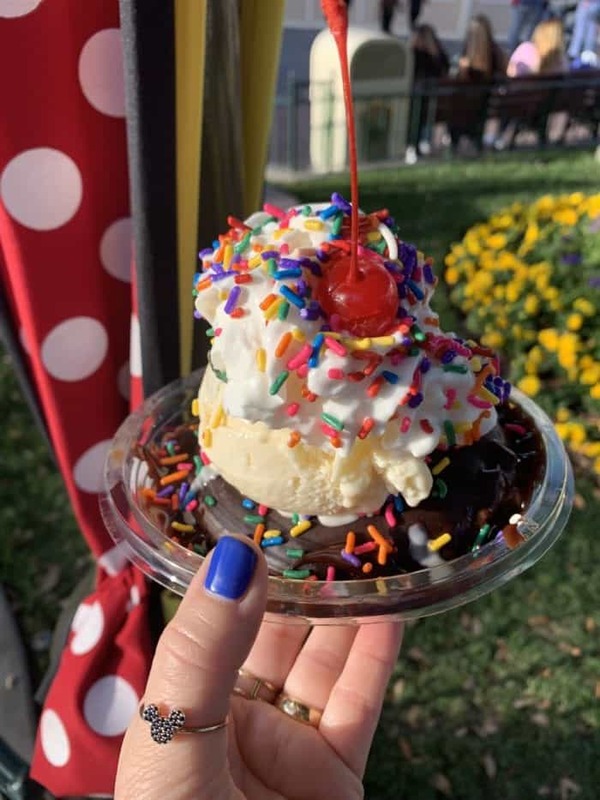 U.S.A. has this super fun Sweetheart Donut Sundae – Warm glazed donut with a scoop of vanilla ice cream, chocolate sauce topping, whipped cream, sprinkles, and a cherry. It is completely photo worthy and a great dessert to share with a few people. It is rich and SWEET. Market House/Starbucks, Main Street, U.S.A.
Market House, also located on Main Street, U.S.A. has this almost too cute to eat Heart-shaped Linzer Cookie. It’s also plenty big to share. I really enjoyed the shortbread style buttery cookie and sweet raspberry gel in the center. Jolly Holiday Bakery Cafe, Main Street, U.S.A.
Jolly Holiday is one of my very favorite places to get sweet and savory menu items at the Park! Their selection is fantastic. This is the Heart-shaped Mousse Dessert with raspberry mousse and vanilla bean crème brûlée center. It was good, but not my favorite of the day. Fun to share and definitely gorgeous. 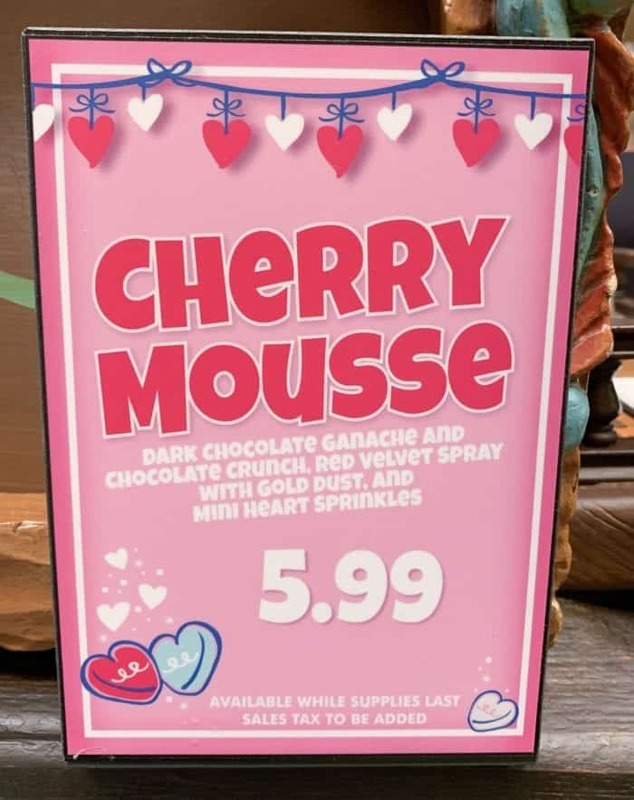 Red Rose Taverne over in Fantasyland has this really festive Cherry Mousse. Cherry Mousse Dessert – Dark chocolate ganache and chocolate crunch with red velvet spray, gold dust, and mini heart sprinkles. This wasn’t my favorite of the Valentine’s goodies I sampled, but still fun to share with a friend or family member. The Golden Horseshoe in Adventureland has this delicious Minnie-Inspired Sundae. 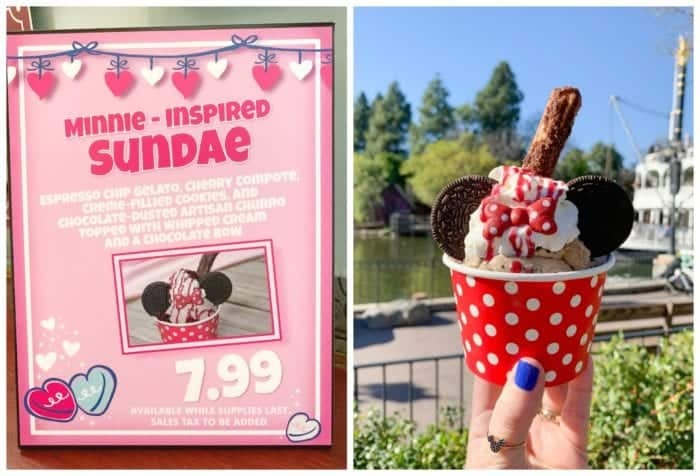 Espresso chip gelato, cherry compote, cream-filled cookies, and chocolate-dusted artisan churro topped with whipped cream and a chocolate bow. If you like coffee flavored ice cream you will love this one. The churro was warm, crisp and soft. LOVED it actually. 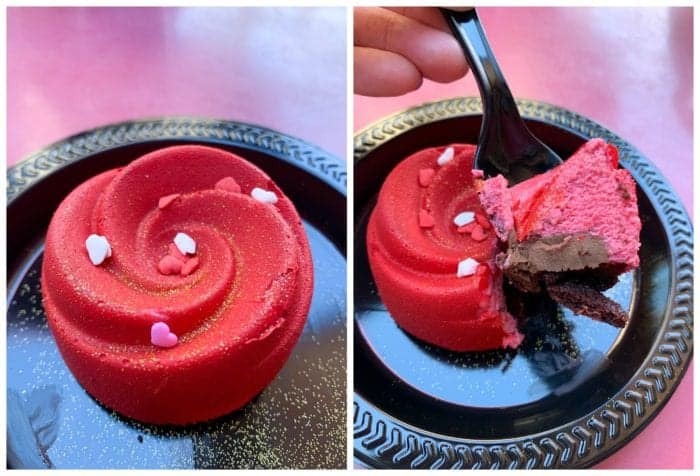 Right next to The Golden Horseshoe, you’ll find Stage Door Cafe where you can get this Strawberry Cheesecake Funnel of Love. 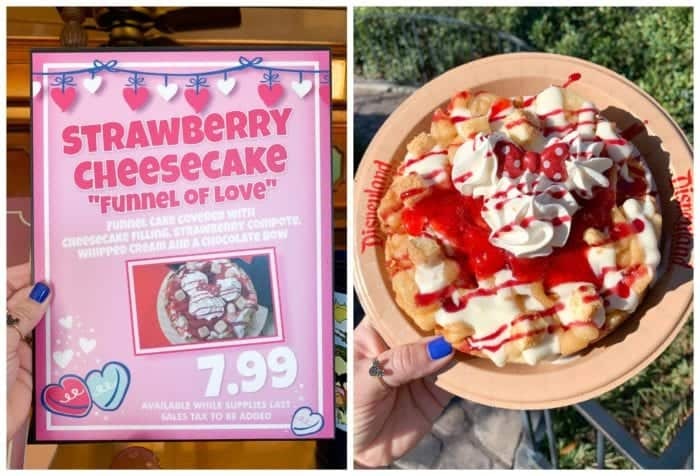 Funnel cake covered with cheesecake filling, strawberry compote, whipped cream, and a chocolate bow. This one surprised me and was my favorite dessert of the day out of all of the Valentine’s goodies. Definitely share this one! You won’t be sorry. Another highlight for me, were these two delicious menu items! The Southern Pork Belly Sliders – Sticky sweet and fiery-glazed pork belly sliders on toasted brioche buns with fresh sliced jalapeños with house-made pickle chips. These little sliders were drool worthy, hoping they keep them on the menu permanently. The Chocolate Lava Cake with passion fruit sorbet and passion fruit sauce was AMAZING. It’s warm and gooey inside. Sooooo worth every calorie. 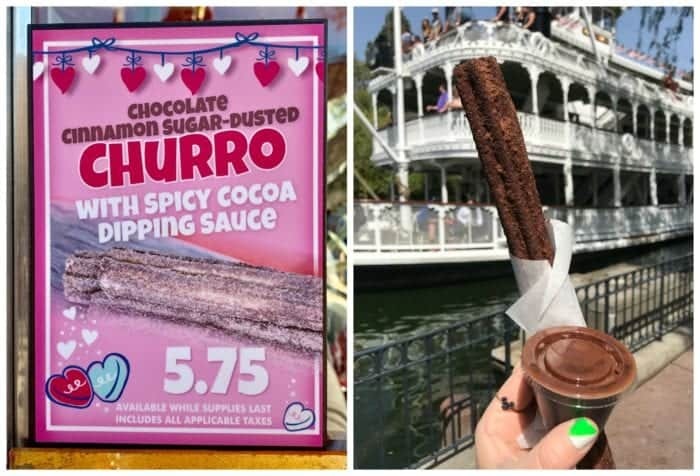 They brought back the what used to be called the “Cocoa Churro” from Pixar Fest and now it is called the Chocolate Cinnamon Sugar-Dusted Churro. 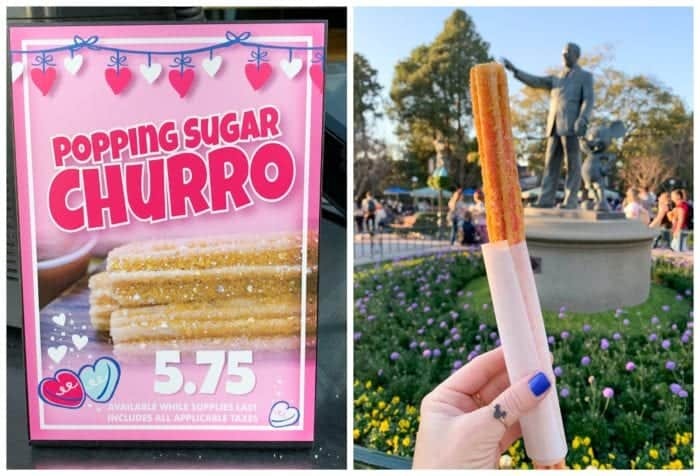 No matter the name, this will always be my favorite of the new churros. It’s fantastic! Don’t forget the sauce. 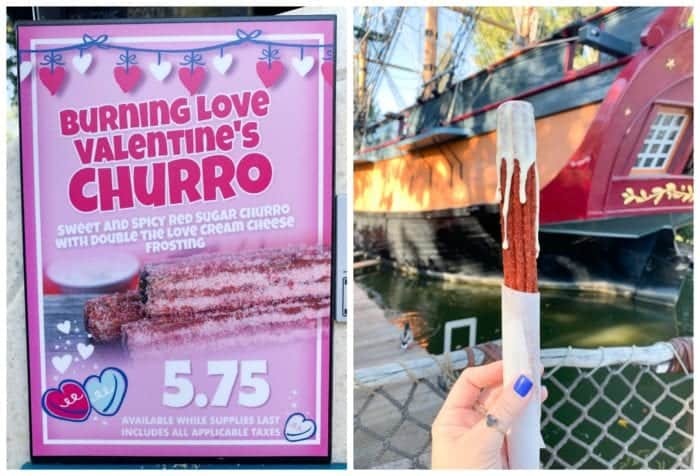 Over at the Churro Cart near Haunted Mansion you can find this Burning Love Valentine’s Churro! Sweet and spicy red sugar churro with “double-the-love” cream cheese frosting. This one was good. It didn’t knock my socks off, but I liked it! I wasn’t sure what to expect with this Popping Sugar aka Pop Rocks Churro. I actually really liked it! Had kind of a fruity cereal flavor. This was a good one. I’d get another for sure. 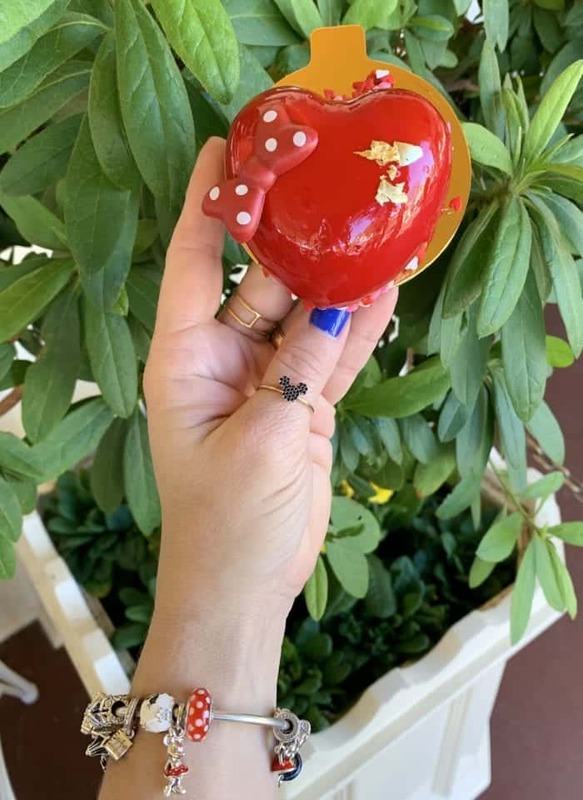 There were some locations I didn’t make it to, for the complete food list for Valentine’s Month check out Disney Parks Blog. Hope you’ve enjoyed my reviews!